Oguro: Sound! 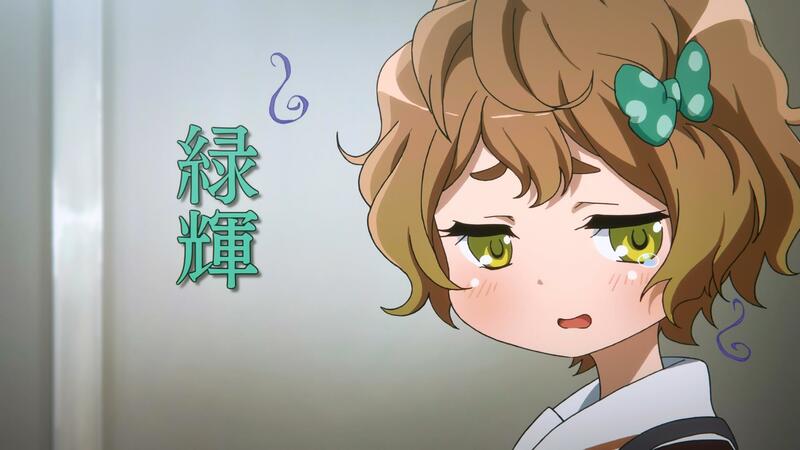 Euphonium was very entertaining. It’s been a long time since I watched a series and wondered how it would go the next week. Hanada: Thank you for your kind words. Oguro: Would you please tell us how you became involved in this work? Hanada: As usual, I received an inquiry asking if I could compose a series around this particular work or not. Oguro: So at that time, was it already planned to be a 1-cour late night anime series? Hanada: Yes, it was planned to be such at that time. Oguro: Was the director already determined? Hanada: I think they had decided on one. Hanada: There weren’t any “this type of image” requests at that stage. Since there was only one novel published at that time, I felt I should just read that and then we’d progress while discussing the story. Oguro: What did you think of the novel after you read it? Hanada: “Animating a wind ensemble is going to be tough isn’t it?” As I read the novel, I felt the story reached its climax around the confrontation between Reina and Kaori, so I thought I’d center the anime storyline around that competition. Something like that….. And then a lot of characters appear in the tale despite it only being one novel, so that could also become a problem. Oguro: I watched the animated version first, so I thought that about half of the characters who appeared were anime original, but no, there’s a lot of characters in the novels as well. Hanada: There are really a lot of them. That’s why I felt thankful it was only one novel instead of feeling like there wasn’t enough material. If there had been more, trying to condense it down into 1-cour would have been quite challenging. Oguro: I think there could be various ways to make this novel into an anime. There definitely should be elements that you devote yourself purely seriously, but more comedic elements could also come out at spots. Did you decide which path to take during your meetings? Hanada: Yes. We did decide that during our meetings. Speaking a bit more about that, it might be more accurate to say that it was really decided as I worked on the scenarios. Oguro: Did you receive any specific orders from either the director or producers about how to structure the series? Hanada: When I was first asked to work on the show, the producers told me “While this series could be said to simply have an ensemble cast, we’d like you to think of it as a show where these four girls stand out.” After that, Naoko Yamada-san strongly felt that we should “bring out the good points of the novel as much as possible.” And then it was made as we discussed things like “well then what are the good points of the novel” and “they’d be these aspects of each character” and so forth. Oguro: The animated version definitely had a strong “character story” feeling to it as well. For example, while Asuka is a deep character in the novel, her personality stands out even further in the anime. Was that something that you thought about while working on the scenarios? Hanada: I thought about things like that while I was writing, but some of it was added while the staff worked on the storyboads. Ishihara-san said “I loved Asuka since when I first read the novel” so I figured that all the episode directors would increase her screen time in the storyboards. I inserted a bit more playfulness in her character at the beginning, but when the series becomes serious in the latter half, her real character starts to come out in the scenario and storyboards. Oguro: She doesn’t say things like “Join us” or “Amigo” from the middle onwards. Oguro: If you think about it, only the first episode had her doing something like pulling out a magic trick to surprise someone. Rather, the ideas that “Asuka is an amazing person”, “what is she thinking?” and “she’s someone whom Kaori is fixated upon” became more important later on. Was that also something that you expanded upon as you kept working on the scenarios? Oguro: So once episode 1’s scenario was finished, you’d then start on episode 2’s? Hanada: All the way until it was finished. Oguro: Did you begin each episode’s scenario from a fully tied together series composition? Hanada: I wouldn’t say they were completely tied together. We had decided a rough “this episode would go to this page of the novel” and then something wouldn’t fit, so I’d put it into another episode while I was writing. Things like that occurred as I was writing. Oguro: So were things like the climax being Reina’s and Kaori’s competition and the final episode being the concert decided in advance? Oguro: Since it’s an ensemble cast, there were parts with something of a documentary feel throughout the show, but this was particularly true for that final episode. Was that also something that came from Ishihara-san at the beginning? Hanada: That was from him. Oguro: Did he specifically say “documentary”? Hanada: I don’t recall if he specifically used that word, but the intention to cover that day of the performance like one was decided from the beginning. For me, I thought if we intended to have the final episode feel like a documentary, then I’d have to resolve all the character drama prior to it. Oguro: Your plan to simply cover the event of the concert day by itself like a documentary wouldn’t work if all the drama prior to it hasn’t been resolved. 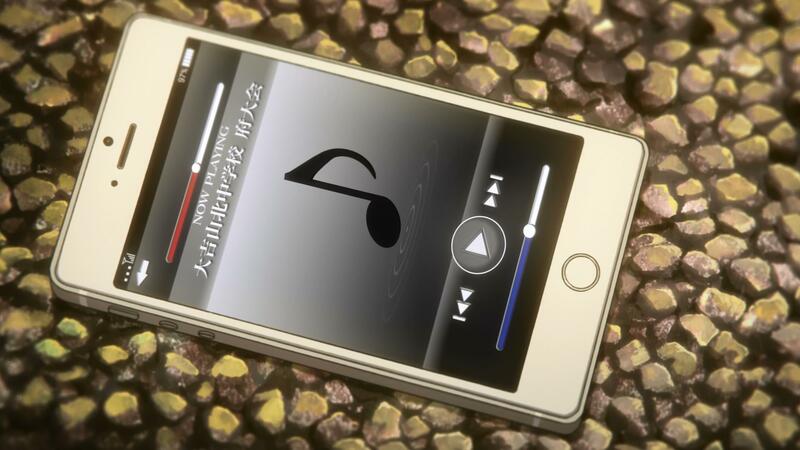 Hence, the confrontation between Reina and Kaori occurs and clears up in episode 11 and in episode 12, Kumiko struggles due to her desire to improve as a musician and then grows. In short, that’s the episode where she becomes the protagonist. Hanada: That was also determined at an early stage. When I was first asked to read the novel, I was told that more volumes would come out afterwards. I thought that perhaps Kumiko’s drama would be settled in those volumes. But the anime may end with just this series. That’s why I thought there may be people who would think “why was Kumiko the protagonist” if the final dramatic point was settled between Reina and Kaori. So as we talked about how she’d be a half-baked heroine if we didn’t give her a proper character arc, I proposed that we make episode 12 into an original episode. It went through many changes until it reached the version that aired. All we decided was that it would be an episode that would solve Kumiko’s arc. Oguro: I see. In the first episode, Reina cries over getting dud gold at the middle school concert. It seems like you decided that Kumiko should know how Reina felt at that moment in episode 12 while you were working on the final episodes, right? Hanada: Yes, I decided she should feel that way while I was working on those episodes. When Reina and Kaori faced off, we worked out that Reina and Kumiko would come to have that conversation. And if so, then I figured that this is what would happen to Kumiko after that. It was pretty much right before I started writing episode 12 that I worked that out. Oguro: Going a bit further back in the production process, everyone except Kumiko speaks kansaiben in the novel. Why did everyone switch to standard Japanese in the anime? Oguro: I’m sorry. I didn’t have time to discuss that when I was interviewing director Ishihara and Yamada-san. Hanada: Making it standard Japanese was an order from the producers so we wouldn’t overly constrict ourselves while casting. Oguro: So that’s why. While the production staff speaks the Kyoto dialect, there’d be a high probability many voice actors wouldn’t. It’s highly likely they’d use some type of phony kansaiben instead. Hanada: I told them that Kantou viewers are unlikely to care that it’s phony Kansaiben, but that was precisely what they were concerned about (laughs). Apparently, it’s possible to feel disgusted by it. Someone even mentioned that pretty much the only anime that was made with proper Kansai accents was Jarinko Chie. Oguro: And if it were in kansaiben, and there would be a need for actors who could properly play a high school girl in a drama, that would further restrict the casting pool. Hanada: Right, the amount of people would also be a problem. I thought it would be alright if only a few of the characters spoke kansaiben. Oguro: But the novel has nearly everyone speaking it. And there may be some nuances changed when you convert the novel’s lines in kansaiben to standard Japanese for the anime. Oguro: When Reina says to Kumiko “it’s a confession of love,” the novel has “this sure is a confession of love,” and the scenario has “that’s why it’s a confession of love.” They’re quite different. It’s different than just changing the dialogue into standard Japanese. Having said that, I remember discussing how to phrase dialogue so that I didn’t lose what was in the novel as well as also not changing things too much when making it into standard Japanese. Perhaps that nuance between calling someone an idiot in standard Japanese used in the (eastern) Kanto region and calling someone stupid in Kansaiben (used in the western regions) would be a good example of that difference. Oguro: Saying“you’re an idiot” in the Kanto region is harsh. Saying someone’s “stupid” in kansaiben is a bit softer. It’s that kind of difference, right? Hanada: It’s especially evident in Sapphire’s case; changing what she says into standard Japanese makes it far less interesting. It was at that point that we started wondering whether it’d be better to change her character overall. Oguro: Ah, so that’s why her character changed a bit. I thought her tone in the novel was cute, but her actions were relatively normal. Or perhaps the anime made her more dreamy. Hanada: That’s right. She became more of a so-called anime character. Oguro: You raised her symbolism? Hanada: Right. In the novel, she was much more positive and self-assured than Kumiko. I left that alone but I thought about making that side of her stand out even more so that it would come through even in the second half, when she did not appear as much. Sapphire was more symbolic in the anime than in the novel. Incidentally, she prefers to be called Midori instead of Sapphire. Oguro: Reina was also shifted towards that “anime beauty” character that isn’t seen in reality: a somewhat unswayed, lonely personality. But that’s not just a question of dialogue. Hanada: I also intended for her to seem like that. I wondered if director Ishihara and Yamada-san had similar thoughts, but I could feel they felt similar when I say the storyboards. Oguro: Reading through the scenarios, I was surprised that the much discussed episode 8 had Kumiko and Reina talking about things other than love and dislikes. Hanada: That resolution is amazing. I thought it was characteristic of Yamada-san to do something like that. Oguro: Why did Reina become such a unswayable character? Hanada: What I tried to keep in mind was that, whilst this story has an ensemble cast, we wanted something that would come across well in an anime series. For that, the protagonist’s perspective is very important. That’s why I thought that we had to bring out Kumiko’s point of view more strongly compared to the novel, by adding more narration, for example. For the character of Reina, this means that the way that Kumiko sees her is what we see on the screen. Hanada: Because Kumiko thinks of her as being noble. I feel those impressions kept getting added on top of each other. It’s not just seen in episode 8 after all. Oguro: Please tell us about Reina and Kumiko and Taki-sensei. Reina likes Taki-sensei, but she makes a “declaration of love” to Kumiko. While it’s not in the novel, Kumiko returns a declaration of love to Reina in the anime. It’s a point where fans watching would wonder which of the two she actually likes. What do you think Hanada-san? Oguro: It’s not just that she admires Taki-sensei; she wants to become his lover, it’s that kind of love. Conversely, Kumiko went from “someone she’s intrigued with” to a “close friend”. Doesn’t it feel like that? Oguro: In my head, I understand that Reina’s feelings towards Kumiko are ‘like’ rather than ‘love’, but the presentation made me wonder: “is this really just liking someone?” That exchange in episode 11 with “If I betray you, feel free to kill me,” “I’ll really kill you” was incredibly intense. Hanada: I believe he was thinking how it would be visualized, but I don’t remember him being opposed to it. Oguro: Looking through the scenarios, Reina becomes softer at an earlier stage than in the anime. Hanada: She does. During episode 5 in the train car if I remember correctly. Reina blushes and her eyes grow bigger in embarrassment after hearing that. Kumiko is a bit surprised at her expression. Kumiko bows her head. Reina looks towards her. Kumko is at a loss for words. Oguro: While Kumiko doesn’t know why Reina is happy, it’s set up so that the viewers would know. Regardless that depiction was completely lost in the final visuals. Kumiko starts running away and since the camera follows her, we’re not able to see what expression Reina has after she says those words. As that depiction was lost, her softer side suddenly comes out in episode 8. Hanada: It certainly does. I think director Ishihara thought it would be fine to proceed without it. I personally like for those kinds of details to pile up on one another in an orthodox fashion, but since Ishihara-san and Yamada-san felt that since Kumiko viewed Reina so highly, it may not feel as charming when that’s put onto film. That’s why they waited to make episode 8 such a huge event. However, I honestly thought “isn’t this too sudden” when I saw episode 8’s storyboards. I brought it up, but both of them thought “this will work.” They felt it had a high chance of succeeding and by looking at the reaction from the viewers, it did since there wasn’t any negative reactions to that episode. Oguro: There was an uproar from the fans as if it was a festival. Hanada: Their judgment was the right decision. Oguro: That doesn’t mean that episode 8’s scenario was very different from the novel or from the finished visual product either. However, those little differences do have an effect. Oguro: “It hurts, but I don’t dislike that” is a line in the novel. Hanada: It is. And so was the comeback “freak” if I recall. Oguro: “Freak” is in the finished version. Hanada: And that’s how it shifts between versions. I know it wasn’t in the scenario. Before that part, the storyboards changed another line a bit to be more effective. Oguro: What kind of person would you explain Taki-sensei as being? Hanada: I couldn’t visualize him at first. It would be good if I wrote him as being charismatic. If this were a show oriented for women, then I’d think about how cool to make him, but that wasn’t the case for this show. If I depicted him as being someone without any flaws, then he’d trend towards a fantasy and feel out of place compared to the realistic characters around him. Thinking about everything made it more difficult than I expected to write him. At first, I went along with how he was in the novel, but, and I can’t recall if it was director Ishihara or Yamada-san who suggested this, I added bits where he was shaken or uncertain about what to do in the latter half. Going along with that, you can somewhat understand that he’s someone with a bit of uneasiness within him. Oguro: So he’s not that confident in himself either. Oguro: One scene that I clearly understood that in was in episode 10 where he scolds the students for taking down the blankets that were put up across the clubroom so that the sound wouldn’t resound. Up until that point, he acted based on how he calculated how the students would respond, but he was troubled over the issues resulting from the audition and so that irritableness came out. Hanada: That was certainly the intention we had for that scene. In the novel, the rumor that went around the students that he and Reina were old acquaintances never reached his ears and so the story continued. But wouldn’t he obviously hear about it during club activities like if someone asked him about it? I used that event from the novel in order to show a different side of Taki. After writing that, I thought I brought it together well. Oguro: In episode 1 when he’s showing his knowledge of shrine fortunes, he’s also shown listening to Kumiko and Reina’s middle school performance. Was he listening to it because he knew that Reina would be attending the school he’d be serving as advisor? Hanada: That was not just limited to their school; he listened to all the middle school performances. Oguro: Ah, I see now! Hanada: At least I wrote it with that intention. He shouldn’t have difficulty listening to a range of performance, so I figured that he’d look into the potential of the students who’d be coming to his school. Oguro: Just checking, but Taki-sensei is more or less the kind of person who doesn’t let his emotions show, and moves things forward using logical reasoning, right? But at the same time, it is a persona that he consciously acts out? Hanada: That’s right. That’s probably his base personality, but as this would be the first time he served as an advisor at a school, I figured that he would have at least some doubt over whether he could pull it off. I researched the advisors at a few high school concert bands and all of them had built up some kind of persona. It’s like they needed a certain charisma to hold the students. The more time a teacher spends as an advisor, the more effective he or she becomes at maintaining that charisma. Hanada: I think Taki’s ability to do that will ensure his longevity as an advisor, but he’s still rather young and there are moments where that facade crumbles. Besides making him more human, we figured it would be the right course for his character. Oguro: You mentioned how only one volume of the novels had been published when you were composing the series. Did the second volume get released when you started writing the scenarios? Hanada: When I started writing the scenarios, the second novel’s plot had been sent to me. Afterward the final manuscript was also sent. Oguro: Did you get a chance to talk to the author about anything? Oguro: Did you inquire about the growth of the characters? Hanada: I didn’t ask about all of them, but I did ask about a few of them. Oguro: Did you ask about the situation with Asuka’s parents? Hanada: Things changed even when the novels were being written. At the time she told me about the completed background, I had completed work on the scenarios. Actually, I had thought about having a confrontation with Asuka and Kumiko as the finale of Kumiko’s arc. I had even plotted the story as Kumiko coming up against Asuka when she is troubled due to her inability to play a portion. However, since Asuka’s character has such a vague backbone, I couldn’t make that work. And so that confrontation was lost and episode 12 became a story about Kumiko’s internal thoughts. Oguro: You depict how amazing of a person Asuka is, but why did you postpone showing why she’s so great? Hanada: If you think about it from Kumiko’s point of view, it’s logical. When we finished composing the anime, Asuka’s story not being resolved was the thing that left a bitter taste in my mouth, but as I started to write, I began to see how we could complete it without telling her story. If we left it as a mystery, then the complexity of her character could be shown in greater amounts. I received the plot of the third novel as I was writing the scenario for the final episode. Before that I had received the plot of the second novel and predicted what would be written in the third volume. When I read it, I saw that it would have a story about Asuka in that volume. I couldn’t write a confrontation between Kumiko and Asuka without establishing a backstory, and since the novel would have presented one regardless, I didn’t want to arbitrarily create one that would differ from what the novel would portray. Oguro: Speaking of original episodes, there’s one that features Hazuki. How did you think of that one? Hanada: That’s episode 6, right? Rather than having an episode that featured Hazuki, I wanted to write an episode that showed a beginner’s point of view. 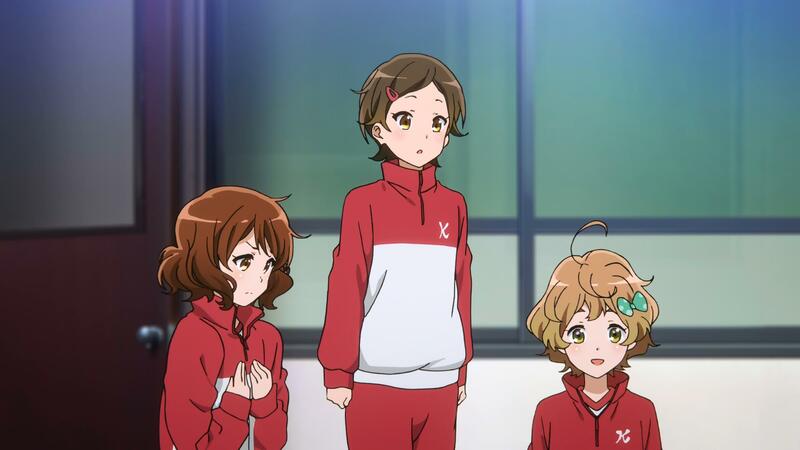 All the other characters, including Kumiko, have prior band experience. That’s why I thought it would be nice to have one episode that would depict her point of view to make it easier and nicer for the viewers who had no knowledge of bands. The producers sent an order saying that they wanted me to make episodes centered around the four girls, so the easiest one to make a story fitting all that would be Hazuki. Those were those two reasons behind its creation. Oguro: The school setting is quite strong in that one. The upperclassmen are acting properly as they take care of their underclassmen. Hanada: I had intended for that episode to be more comical. However, as my first draft felt out of place compared to the rest of the series, I eventually toned it down. There were more moments of laughter like the scene with Kumiko wearing the costume. Hanada: I had gags like Hazuki saying “Maybe I should quit the band….” and everyone looking shocked, but those funny portions were changed for this episode as they were too strange. You could say the character reactions were more anime-like. Oguro: So if you’d gone with that, then this would have been the most anime-like episode in the entire series. Hanada: It would have be. Oguro: I wanted to ask director Ishihara about this too, but the scene at the beginning of episode 5 when Kumiko is moping about her chest size had its jokes changed quite a bit from the scenario and the version that was broadcast. Why was that? Excerpt 5: Episode 5’s physical exam opening. In both the finished work and the scenario, Kumiko’s chest hasn’t grown. However, in the scenario, Sapphire has more of a chest than Kumiko and so Kumiko becomes even more depressed. Afterwards, Hazuki, thinking Kumiko is upset that she’s gained weight, tries to cheer her up and then more old-geezer style gags occur when they see Azusa shows up. Hanada: I think Ishihara-san may have some kind of idea about that. Oguro: Was it him or was it the person drawing the storyboards? Hanada: Probably Ishihara-san. At the time the scenario was being written, they were still designing the characters’ appearance, so we took for granted what their chest sizes would be. Hanada: Yamada-san was also thinking that Midori would be someone who would dislike her chest size, so that may have also influenced it. If we made her chest too large, it would be very anime character-ish, wouldn’t it? Oguro: Small in height, big in chest? Hanada: Yes, yes. That desire to have a girl with small height and large breasts would be something we’d more or less consider “anime-ish” is something that we all feel to a certain extent. However, if we did that, it feels like it wouldn’t fit the core of this show, so we restricted ourselves to things that should be in the show. Oguro: It doesn’t mean that the staff themselves necessarily likes small breasts. Oguro: So though those ideas came out in the scenario meetings, but in the end there were girls with both big chest and small chests. Oguro: So in the scenes where Reina is not around, the main girls all have flat chests? Oguro: Speaking of episode 5, that’s nearly mid-way through the series. Were the character designs still not finished at the time that episode’s scenario was being written? Hanada: That’s right. With Kyoto Animation, the scenario often takes priority. Oguro: So the designs are made to fit into the solidified story? Hanada: That’s generally how it’s done. But even if we’re quite far along, it’s also possible to return to an earlier scenario and change it. Hanada: There were changeshere were about 4-5 drafts for each episode. At first I didn’t have any orders from either Yamada-san or Ishihara-san. There wasn’t anything like “I want this to happen in this episode, so write it like this” or “I want this kind of scene in this episode, so please write do this.” Instead, I’d actually say that there were many cases where they asked me to “please write what you think it should be” to start. Then as they saw that scenario, they would point out what they wanted me to change. Oguro: So you would write the scenario to start and then they would provide their opinions on it. Hanada: They would say things like “I think this would be a better thing to do in the scenario” and “this feels a bit off, so let’s re-think the entire thing through.” It wasn’t just limited to Euphonium, that generally happens whenever I’ve worked with Ishihara-san and Yamada-san. Oguro: So they don’t bring some rough sketches along, like“I want to do this kind of scene”? Hanada: That’s right. That’s normally how it works, but I never get it from them. It’s probably best illustrated by something that Yamada-san told me once: “Just throw it wherever you want. We’ll catch it, all of it.” (laughs) I often hear that kind of thing from them. Oguro: In short, both of them have this “director’s brain.” They’re not the writer type who give form to the story they want to tell; they’re the director type who think about how to assemble the raw materials they’re given. Hanada: Yep. That’s exactly what they are. Oguro: Was there anything that happened at the scenario meetings that stuck with you? Oguro: So they wanted you to write what you found interesting. Hanada: Right. They told me “It’s problematic for us if you don’t do that.” When I’m writing, I often wonder if it’s ok for them to leave so much in my hands. Hanada: There were some. For example, I was really happy with the monologue where Kumiko said she felt like she was being taken away by the Snow Woman. If I remember correctly, Ishihara-san opposed it, saying that the Snow Woman story wasn’t like that, but Yamada-san said that it was fine as it was. In the end, Yamada-san’s opinion won out. I myself knew that the Snow Woman story doesn’t go like that, but I wrote it because I thought that the nuance worked quite well. Hanada: I also love that feeling. You can call it ‘over-doing’ it, or rather, it leaves an impression that sticks right into you. Ishihara-san tended to fall on the “isn’t that over-doing it a little?” side. Hanada: It’s somewhat surprising, but Yamada-san will really back those kinds of things. It’s amazing how they create that kind of balance and bring it to the creative process. (points to a corner of the long table used for interview) During our meetings, the three of us sit over there, creating a little triangle. Always the same little triangle. The second part of this interview is linked here. This entry was posted in Hibike Euphonium, Kyoto Animation, Translations and tagged animestyle, jukki hanada, series composer, sound! euphonium, Translation. Bookmark the permalink.